Reading and share top 6 famous quotes and sayings about Mechanization by famous authors and people. 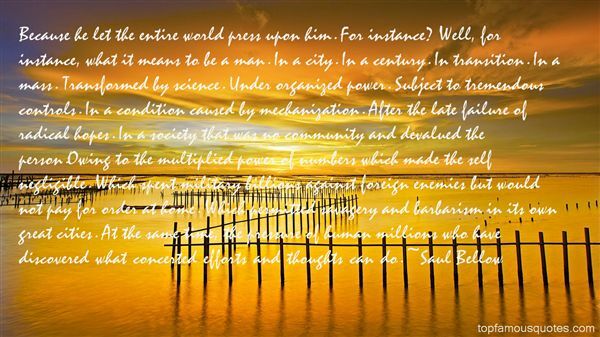 Browse top 6 famous quotes and sayings about Mechanization by most favorite authors. 1. "A lot of the critique of our growing mechanization was actually at its strongest, and arguably at its most perceptive, during the late '60s." 2. 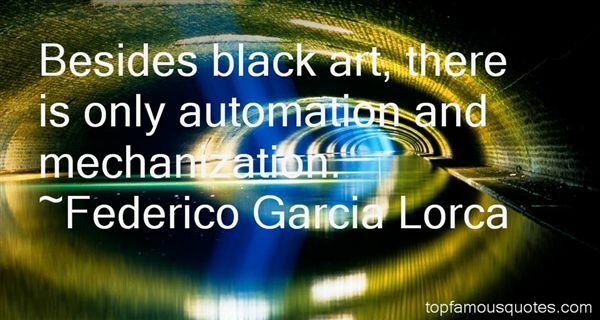 "Besides black art, there is only automation and mechanization." 3. 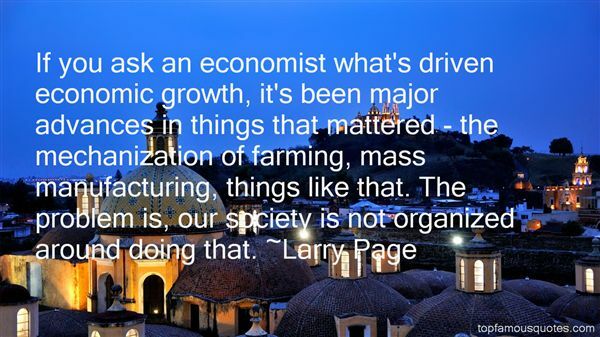 "If you ask an economist what's driven economic growth, it's been major advances in things that mattered - the mechanization of farming, mass manufacturing, things like that. The problem is, our society is not organized around doing that." 4. "Even as the population doubled from three to six billion, we managed to race ahead with all kinds of technological and scientific events in agriculture - from using more fertilizers to mechanization to advanced plant breeding." 5. "Because he let the entire world press upon him. For instance? Well, for instance, what it means to be a man. In a city. In a century. In transition. In a mass. Transformed by science. Under organized power. Subject to tremendous controls. In a condition caused by mechanization. After the late failure of radical hopes. In a society that was no community and devalued the person.Owing to the multiplied power of numbers which made the self negligible. Which spent military billions against foreign enemies but would not pay for order at home. Which permitted savagery and barbarism in its own great cities. At the same time, the pressure of human millions who have discovered what concerted efforts and thoughts can do." 6. "It is of course no secret to contemporary philosophers and psychologists that man himself is changing in our violent century, under the influence, of course, not only of war and revolution, but also of practically everything else that lays claim to being "modern" and "progressive." We have already cited the most striking forms of Nihilist Vitalism, whose cumulative effect has been to uproot, disintegrate, and "mobilize" the individual, to substitute for his normal stability and rootedness a senseless quest for power and movement, and to replace normal human feeling by a nervous excitability. The work of Nihilist Realism, in practice as in theory, has been parallel and complementary to that of Vitalism: a work of standardization, specialization, simplification, mechanization, dehumanization; its effect has been to "reduce" the individual to the most "Primitive" and basic level, to make him in fact the slave of his environment, the perfect workman in Lenin's worldwide "factory." Mereka yang menghirup kopi pahit umumnya bernasib sepahit kopinya. Makin pahit kopinya, makin berlika-liku petualangannya. Hidup mereka penuh intaian mara bahaya. Cinta? Berantakan. Istri? Pada minggat. Kekasih? Berkhianat di atas tempat tidur mereka sendiri! Bayangkan itu. Bisnis? Mereka kena tipu. Namun, mereka tetap mencoba dan mencipta. Mereka naik panggung dan dipermalukan. Mereka menang dengan gilang-gemilang lalu kalah tersuruk-suruk. Mereka jatuh, bangun, jatuh, dan bangun lagi. Dalam dunia pergaulan zaman modern ini mereka disebut para player."